Drylands present a serious problem for agriculture and for human development; and the problem is worsening. Standard agricultural practices have actually created major deserts in the world including the deserts around Mesopotamia. Twenty-five percent of the land on Earth is either desert or threatened with desertification. The problem strikes poor regions (like Africa with 66% of the land affected by desertification), and rich regions alike (as with Texas, where 40% of pastureland is now too arid for use). Almost 70% of the agricultural dryland is degraded by desertification. Yet, our agricultural practices remain largely unsuitable for most climate conditions exacerbating the problem. Our methods are contributing to salinisation and soil erosion. Tragically, many people live in or depend on the agriculture from these areas. Generally, in most arid regions there is enough rainfall to re-green an area, but the rain that does fall quickly washes away taking precious soil with it. One of the strategies that has proven affective in combating and even reversing desertification has been reafforestation. Trees help the land hold water, are more drought tolerant than most plants, and their detritus helps build up soil. 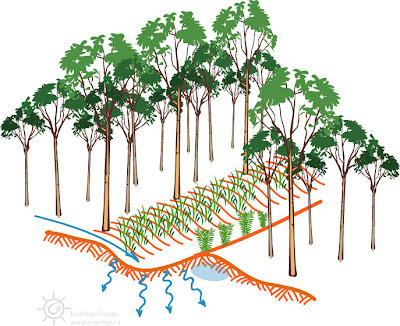 Trees serve as windbreaks which help reduce evaporation and soil erosion, and provide shelter for humans and animals. 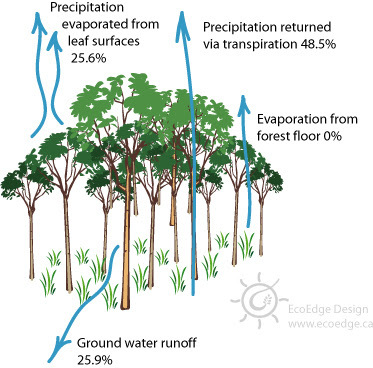 Trees also make up a significant part of the hydrological cycle, providing virtually 100% of the water for inland continental rainfall. Consider the situation in the two most populous nations in the world: China and India. China is suffering from encroaching deserts and already has 19% of its land suffering from salinisation. India is chiefly arid or semi arid, though this was not always the case. Eight Thousand years ago, Asia had an estimated total of 15.132 million km2 of forests. Today, that figure is down to only 4.275 million km2, of which just 0.844 million is natural forest (i.e. not tree plantations). To assist in reafforestation, we can make use of the swale. 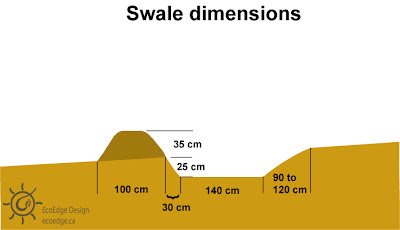 Simply put, a swale is a water-harvesting ditch cut level into the ground on contour. Swales are not diversions ditches. Their job is not to carry water form one place to another. Water will continue to flow over land until it reaches the lowest point it can find. Creating swales is essentially creating low points for water to collect in. The swales catch rainwater running off the land, allowing it to soak into the land. Once in the ground, water is more protected from evaporation – a very serious problem in deserts – which reduces the problem of salinisation. 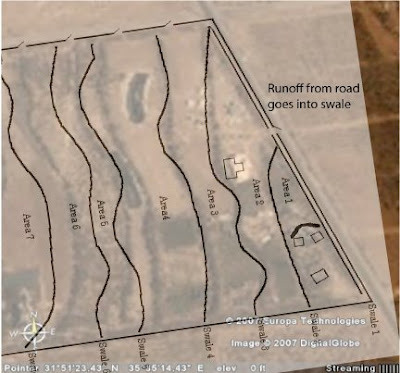 Swales are often the most cost effective type of earthworks (depending on the situation), catching the most amount of water for the work put into their construction. Once constructed, swales greatly assist the growing of trees by capturing rainwater that would otherwise run off the land, eroding the soil in the process. Additionally, swales also help to recharge groundwater – a water source that has become greatly taxed since the proliferation of motorised pumps following WWII. By reducing soil erosion and capturing water that would otherwise have been lost, swales contribute to the creation of healthy soils. The trees grown in conjunction with swales can further aid in soil stabilsation and can contribute vital nutrients for the soil from this detritus. 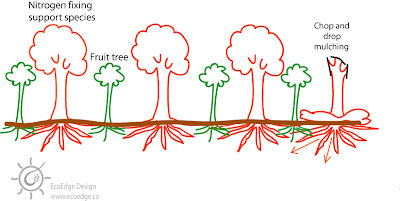 Trees and associated groundcover plants can provide symbiotic hosts for mycorrhizal fungi, which, in turn, can boost plant growth, protect plants from acid rain, salt and pollutants (see also here), and greatly benefit the fertility of the soil. Arid climates are characterised by large rainfalls occurring in just a few events each year. As such, swale dimensions in these regions will be a little different than they would be in regions with more rainfall. 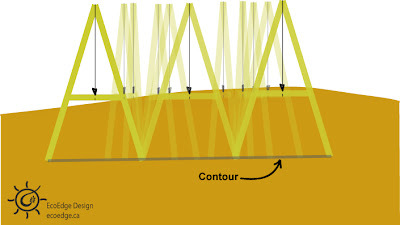 One easy and inexpensive way to find a level contour is to construct an A-frame as shown in the diagram and hang a string with a weighted end down from the top of the A-frame. Find a level surface and mark on the cross piece where the string points to. This mark will show you where level is as the diagram below shows. You can use this A-frame level to map level areas along the ground. Along the level point, place stakes as markers. At the end, you will have marked out a contour line. Mark out contour lines about 20 metres apart from one another. (Twenty metres is a rough guide, as the shape of the land will make the contour lines closer in some places and further apart in others). Dig the swales to be 2 to 3 metres across and about 50 cm deep. The excavated earth is used in construction of the swale’s mound on the downhill side. When digging the trench and when constructing the mound of the swale, do not compact the earth. This will assist in water infiltration. Also take care to make the top of the swale level. In this way, it will be less likely to erode should they overflow with rain. Below is a sample of an actual swale designed by designer Dan Palmer. 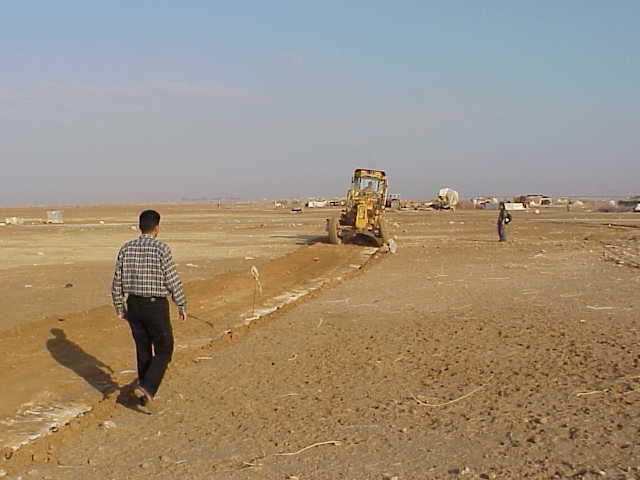 These measurements can be flexible as long as these swales for drylands are about 2 to 3 metres across. After the swales are dug, you want to mulch the area and plant groundcover vegetation to cover the bare earth that has been exposed. Since you will be planting trees along the swales in the future, you want the canopy of the trees at maturity to shade the swales. This will help reduce evaporation. Swales can be mulched to assist in water retention, and the swale itself can serve as a footpath. Allow at least one heavy rainfall to fall before planting trees along the swales and do not plant on the swale mound itself. This will help ensure the survival of the newly planted trees. The following species will absorb nitrogen from the atmosphere and, with the aid of symbiotic bacteria, will fix the nitrogen in the soil. Tagasaste (Chamaecytisus palmensis) – Requires over 300mm of rainfall per year. Grows to a height of 7 metres. It makes an excellent protein-rich fodder crop. Salt wattle (Acacia ampliceps) -Requires between 250 – 700 mm of rainfall per year. Grows to 2 to 8 metres in height. Tolerates alkaline and saline conditions. Makes good fuel or timber for posts. Can be used as fodder. Chisholm’s wattle (Acacia chisholmii) – Requires between 190 and 800mm of rainfall per year. Grows 2 to 3 metres in height. It can be used for fodder or fuel. Australian pine (Casuarina equisetifolia) – Requires from 175 to 1500mm of rainfall per year. Grows to 8 to 16 metres in height. Makes a good windbreak and controls erosion. The wood is durable and makes good posts. It is a good fuel tree yielding 4950 kcal per kg and will burn when green. It also makes good charcoal. The bark is tannin rich and can be used for tanning. Rosewood (Tipuana tipu) – Drought tolerant once established. The trunk will grow up to 1.6 m across, and the tree can grow 40 m tall. This tree yields good timber. Pigeon Pea (Cajanus indicus) – This tree is drought tolerant and might be a possiblility. Its protein-rich peas are edible and are sometimes used to make dal. The food can be used for fuel, fencing or thatch. Planted over chicken ranges, these trees can feed chickens. Neem (Azadirachta indica) – Drought tolerant. Grows 15 to 30 metres in height. The trees has anti-septic properties and it used for everything from oral hygiene to head lice treatment. This is one of the great trees of India. Mexican pinon (Pinus cembroides) – Requires 270 mm to 800 mm of rainfall per year. They yield pine nuts which can be roasted or eaten raw, and can be ground to make flour. Olive (Olea europaea) – Drought tolerant. The olives can be eaten or used to make olive oil. This list is not exhaustive, and other species are certainly possible. Other species can be selected based on human needs for food, medicine and fuel, or for animal fodder. When planting the initial system to repair the landscape, 90% of the species should be the support species: the nitrogen fixers. Among them, interplant the long term productive fruit, nut and timber trees. As the system grows, you can trim the support trees (or cut them out entirely for timber or fuel). The trimmed branches should be left laying where they fall so that they provide mulch and nourish the soil. The following diagrams represents ‘chop and drop’ fertilization. 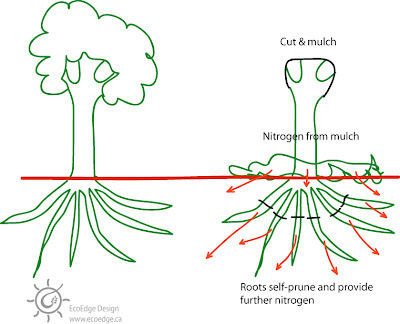 For the purposes of demonstration, they show the entire tree being cut, but in reality, the tree would only be trimmed until it was ready for final harvest. I pleased to discover you. I discovered permaculture a few months ago. I have some land in west Texas, (10 inches / year,) and am just about to begin putting in some swales. Oh, by the way, I live in Toronto. Lol, yes go figure I have land in west Texas. Do you have a permaculture farm in Tweed? Would love to visit. My friend and I may be developing a property near Picton so could probably visit you. I’ll probably be in Toronto for a couple of weeks later this month then back to Texas. South Africa is dry and mostly landlocked making it a water scarce country to engage in Agricultural production, rain in summer is not enough for drinking nor irrigation and other human activities requiring water usage. Rain harvesting becomes the paramount and can’t do without exercise into the future. Swales are a must for Permaculturists but a bit challenging especially to those that do not have access to mechanized tools to dig these in elevated and sloped surfaces, this needs serious budgets to do and most disadvantaged black South African cannot afford these challenges when they they have to survive on meager salaries earned and the forever declining currency strength. Could the Permaculture enthusiasts and practitioners out there help me with this one. I am new and upcoming farmer who would love to have my community engage in Permaculture but the mapping and scaling of landscape seems to be for experts and expensive (this is my assumption) Any easier alternatives as we are about to map our area for key-lines and first big swales on the upper levels of the elevated sloped area we live in? Hi, I simpatise with not having mechanical equipment for earthworks. A major planning tool of permaculture is to start small. So one step at a time, but allow for expansion (plan). This includes earthworks. A good example to look at online is from Kubiqi (spelling may be wrong). Here it each tree was planted with its own individual swale to begin with. Although being China, this was done in large numbers. So cooperation helped increase the scale. I hope this helps.